A complete Digital Poster Solution for advertising, timetables, notifications and more. Simple to use and are purpose built for use 24/7 in commercial environments. These totem ePosters are a complete advertising solution – just connect the power and load your Full HD resolution images and videos for a fast and easy advertising display. The tempered glass front, rounded corners, super slim profile and aluminium frame all add to the eye-catching tablet like aesthetic of these sleek totems. The smart looking and familiar design blends seamlessly into any environment. These high-definition displays are simple to operate and are purpose built for commercial use. Simply load your media onto a USB stick, insert it into the screens upload port, remove when prompted and it is ready to go. It really is a plug and play solution. The totem displays are fitted with commercial grade LCD panels providing them with wide viewing angles, exceptional colour, contrast and brightness, and crucially the ability to operate 24 hours a day. With an eco-friendly power timer and low consumption LED backlight you can be assured of their green credentials and overall low operating costs. Also included with each totem is a simple and intuitive piece of software which allows you to Schedule different content to play at different times of the day. You can also add scrolling text to compliment your content and really get your message across. These Slim Digital Advertising Display totmes also feature HDMI and VGA inputs, allowing you to connect external video sources such as a PC or external media player if required. 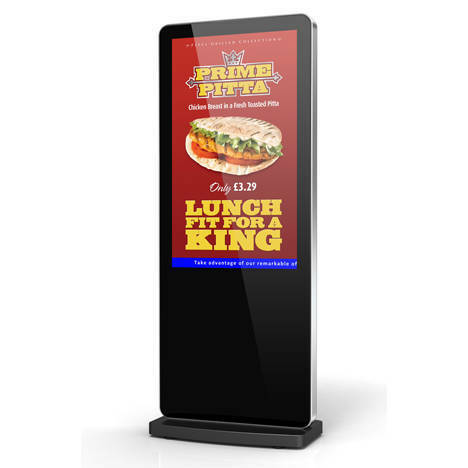 With built-in wheels these digital advertising totems are easily manoeuvred from location to location making them ideal for temporary signage or exhibition usage. We can also provide a custom flight case for protection during transportation if you are looking to take these on the road regularly. For more advance use the Android Freestanding Digital Posters come with a piece of free Scheduling Software for displaying different content at different times of the day as well as setting image display duration and transition effects. For example, a restaurant can create three daily schedules; the breakfast menu in the morning, lunch menu in the afternoon and the dinner menu in the evening. The eco-friendly power timer allows you to assign daily or weekly on and off times for your screen. The ability to power on and off automatically means that the screen is only in use when it needs to be reducing your power bills. Scheduled on and off times are a key features of professional displays and often overlooked when people consider using domestic TV’s for their digital signage. If you want to manage your display remotely you can upgrade to the Networked option which allows you to update your screen over the internet via LAN or WiFi. The on-line CMS gives you much more control over the layout and appearance, as well as allowing you to embed web pages, social media feeds, weather and other real-time data on screen.The Content Management System is subscription based with an annual fee. The first year is included with the Network upgrade but you can also opt to purchase multi-year bundles at a discount.